Eugune E. Grubaugh, 90, of David City, died Sunday, October 14, 2018 at david place in David City. 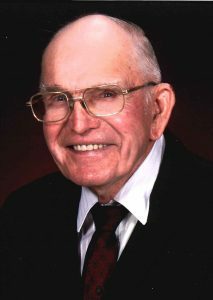 Visitation Thursday, 5:00 p.m. to 7:00 p.m.
Eugene E. Grubaugh was born September25, 1928, at rural Rising City, Nebraska to Arthur and Ida (Hickstein) Grubaugh. He attended schools in Rising City and Shelby, graduating from Shelby High School. Eugene served in the United States Army in the field artillery battalion from 1950 to 1952. He had served in Germany and was honorably discharged. Boy Scout troop #268, youth baseball, American Legion Post #125, Knights of Columbus, Senior Center, 4-H, Butler County Ag Society, Knights of Aksarben, David City Volunteer Fire Department. He was also honored with the Chamber of commerce volunteer of the year award, Good neighbor citation from the Knights of Aksarben and the Seven hats award from the American Public Power Association. He is survived by his wife Margaret of David City, Children and spouses: Connie Perry of Columbus, Ken Grubaugh of Michigan, Jeannie (Steve) Ienn of Columbus, Paul (Deb) Grubaugh of Platte Center, Tom (Kim) Grubaugh of Columbus, Corey (Stacey) Grubaugh of Columbus and Carey (Tonya) Grubaugh of Platte Center. 19 grandchildren, 25 great grandchildren, 4 great great grandchildren. Sister Doris Stoll of David City. He was preceded in death by his parents, daughter & son-in-law Mary Ann (Paul) Day, brother Robert Grubaugh, 3 sisters, Lenora Alt, Betty Powell and Barbara Kastl.